Made in the slow cooker (or stovetop if you prefer), this hearty soup is a breeze to make! Nothing says comfort quite like a Thanksgiving feast with its combination of saucy, creamy, cheesy, sweet and savory flavors. Most of us have family favorites that we can’t imagine not including on our Thanksgiving table, but probably most would agree that turkey, stuffing, cranberries and potatoes are standard “must-include’s”. 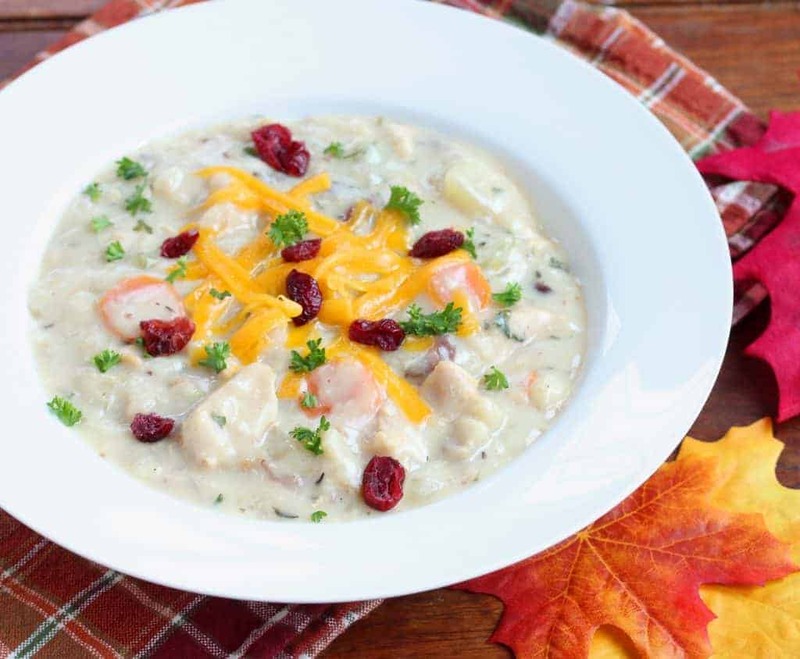 This recipe for Creamy Turkey Dinner soup features all of those favorite ingredients and the slow cooker makes this meal virtually effortless! 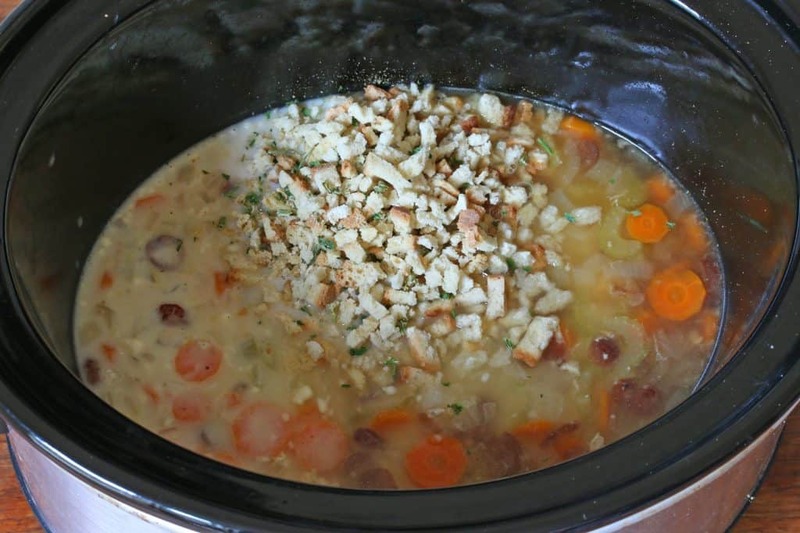 Add all of the ingredients to the slow cooker except for the milk, flour and stuffing. Cook on LOW for 5-6 hours or on HIGH for 3-4 hours. During the last 20-30 minutes of cooking, make a slurry by dissolving the flour in the milk until no lumps remain. Stir the slurry into soup and stir. Then add the stuffing and the additional cranberries (the already cooked cranberries will contribute flavor to the soup but will have lost most of their color). Cook for another 20-30 minutes until the stuffing is soft and the soup is thickened. Add salt and pepper to taste. Serve immediately sprinkled with cheddar cheese if desired. The stuffing will continue to expand so the soup will get thicker the longer it sits. If eating leftovers, add some more milk when reheating to thin it out. 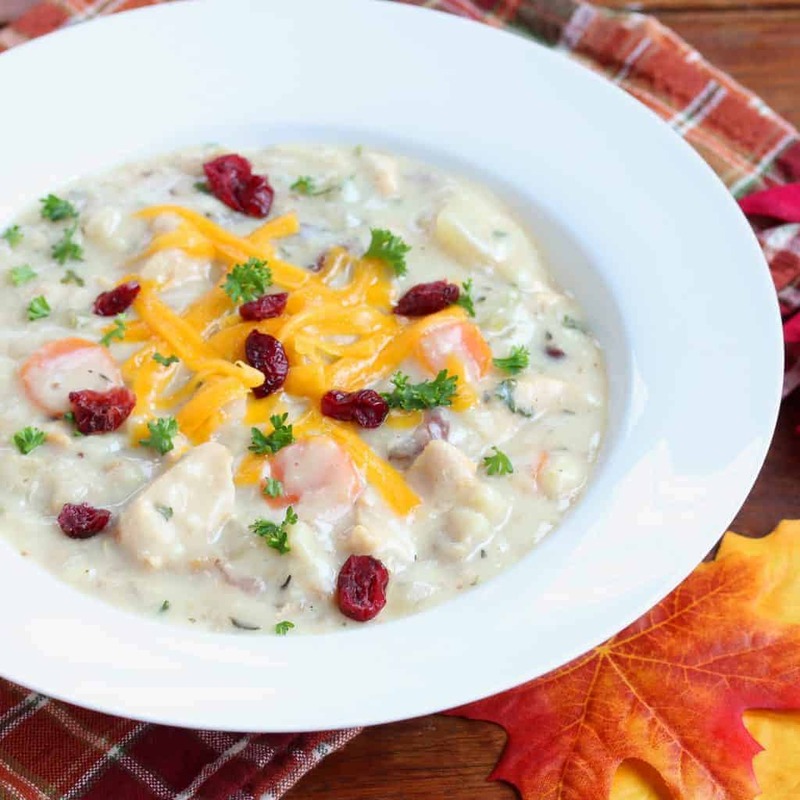 All your favorite Thanksgiving fixings in one delicious, fuss-free soup! I get so excited when I find new soup recipes! Yum! This soup would be perfect for leftovers, and I love that you added dried cranberries! This soup looks amazing! Turkey dinner in a bowl is genius!! This soup looks delicious! Saving this! 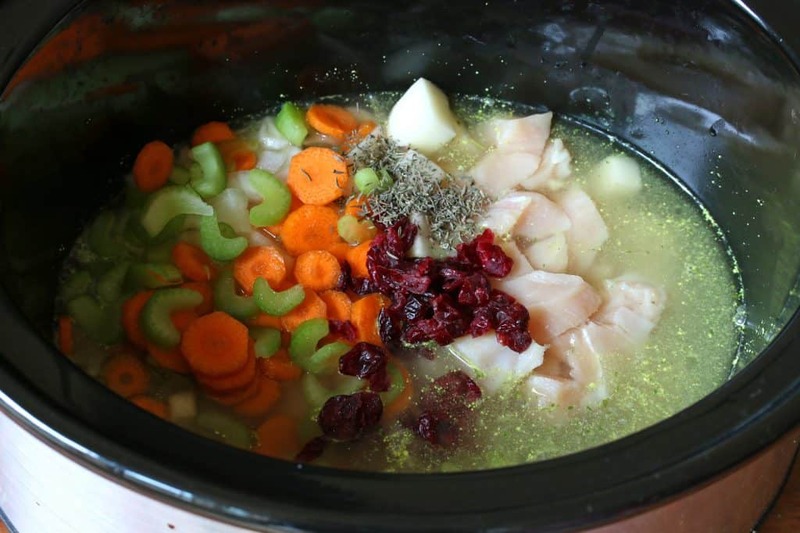 Hi…Kimberly!this is amazing and your creamy turkey dinner soup looks sooo yummy and good.i will trying to making this soup. Thanks for sharing….! We eat soup at least twice a week, so I am always happy to find something new. This one looks so comforting and delicious, I am sure we would love it. And leftover turkey is something we have often. I need to try this soup out! It looks great! Love this as a use for leftovers! I have got to try it out! I’m LOVING these flavors! What a delicious bowl of soup! I don’t see any flour in the list of ingredients! Thanks for catching that, Jon, it’s there now! I can’t wait to try this. Does anyone have an idea of how long to do the initial cooking for in a pressure cooker? Thanks!